Birthday celebration of the Minister were also conducted at his native place Nagaram in Suryapet district on a grand scale. Free food was donated to the poor at the village. Poor feed programme organized at Suryapet twon on the occasion of birth day of Minister for Power and SC Development G Jagdish Reddy on Wednesday. 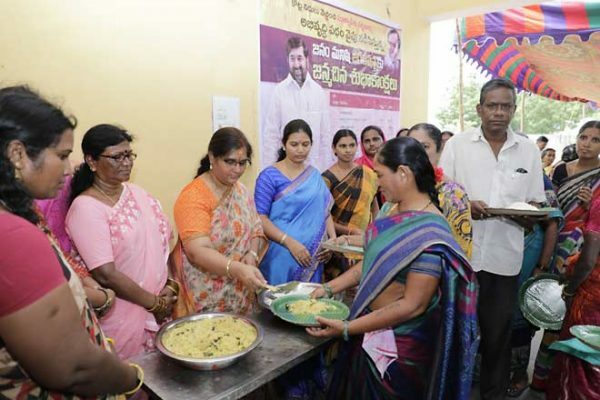 Nalgonda/Suryapet: Blood donation camps, distribution of fruits to patients in hospitals and books to students in schools, ‘annadanam’ to poor, marked the birthday celebrations of Minister for Power and SC/ST development G Jagadish Reddy on Wednesday. Rajya Sabha member Badugula Lingaiah Yadav, TRS MLAs Pylla Shaker Reddy, Vemula Veeresham, N Bhaskar Rao, Kusukuntla Prabhakar Reddy and Ravindra Kumar Naik were among those, who met the Minister, at his camp office in Nalgonda and conveyed birthday wishes to him. Zilla Parishad Chairman Nenavath Balu Naik participated in birthday celebrations of the Minister at Devarakonda town. Birthday celebration of the Minister were also conducted at his native place Nagaram in Suryapet district on a grand scale. Free food was donated to the poor at the village. TRS and TRSV leaders donated blood at camp organised near clock tower centre in Nalgonda. TRS functionaries celebrated birthday of the Minister by cutting cake at almost all mandals in Suryapet and Nalgonda districts. Poor people were fed at Arvepally of Jajireddudem mandal and Bibinigudem of Chivvemla mandal in Suryapet district. TRS leaders also distributed fruits to patients in government hospitals at Nalgonda and Suryapet.